It is not easy to keep an octopus in an aquarium, but it is not impossible either. This project should however only be endeavoured by those who are willing to devote time and effort, and quite a lot of money as well, in order to provide the octopus with optimal conditions. Previous aquarium experience is always recommended. Since the octopuses are marine animals, they will be much easier to keep for those with previous experience with salt water aquariums. Also keep in mind that the expected life span of an octopus is short. In the wild, the males die after breeding while the females stay alive just long enough to care for the eggs until they hatch. Even if you prevent an octopus from breeding it will seldom grow older than 1-2 years. I should however be stated that since octopus keeping is such a small and comparatively new hobby, we can’t say anything for sure. Maybe there are octopus species out there somewhere in the ocean that would live happily for several years in captivity. 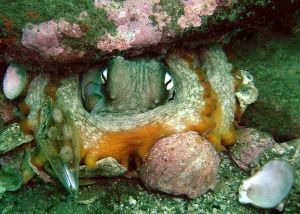 Finding a suitable octopus can be tricky, since they are not very commonly kept by fish stores. It is also important to choose a suitable species. Since octopuses are so rarely kept by hobbyists, it is hard to give any recommendations regarding which species is most suitable. One important factor is naturally the size of the octopus; you must be able to comfortably house it. It needs a place to hide in, such as cave, as well as water to swim around in. If you want a night active species, the Octopus bocki (Red Octopus) can be an option since it has been successfully kept by several aquarists. Keep in mind that nocturnal species will typically only leave their hiding space when the aquarium is completely dark. Since they are night active, they will not change colours. If you prefer a less nocturnal species, the Octopus vulgaris is one suggestion. A problem connected with choosing an octopus is that even experts can have a hard time identifying different octopus species. The requirements of your octopus will naturally depend on the exact species, and the best way of providing your octopus with supreme conditions is to obtain information regarding the natural environment of your specific octopus species. Generally speaking, a pH around 8.0 is a good rule of thumb. Keep the levels of ammonia and nitrate at zero, and allow the nitrate to rise no higher than 5 ppm. The closer the nitrate is to zero, the better. Phosphate levels below 0.1 are recommended, as is a KH around 12. The salinity should be around 1.025. A large aquarium is advisable, since this will make it much easier to keep the water chemistry stable. Keep in mind that the octopus can use it strong arms to escape from the aquarium, so the cover must be made octopus safe. Despite having no bones, even a small octopus is remarkably strong. Their versatile bodies also make it possible for them to squeeze through even tiny gaps in the aquarium. An octopus should ideally be kept alone in the aquarium, since it might eat anything that is smaller than itself and be scared and stressed by anything that is bigger. 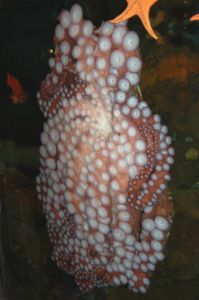 An octopus must have places to hide in the aquarium to relive stress and allow for natural behaviours. Tuffa Rock or similar can be used to created caves and other shelters. Fluorescent light is suitable for day use, and red LED’s can be turned on during the night. If you want to use live aragonite as a substrate you should add it beforehand and allow it to mature before your introduce the octopus. Do not add the octopus to the aquarium until the aquarium has been properly cycled and you are sure that all the equipment is working. 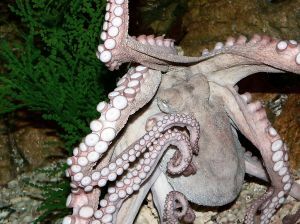 Since the octopus is a marine creature, it will require a salt water aquarium. Sufficient filtration is extremely important. Extra gadgets such as a protein skimmers, nitrate reactors and trickle filters will increase your chances of successfully keeping an octopus even further. Other devices which makes octopus keeping easier are U/V sterilizers. When you add the octopus to the aquarium you will naturally have to acclimatise it just as you would with other aquatic animals. You can feed most octopus species shelled cockles. In the wild, the octopuses eat a lot but being kept in aquariums can make them stressed out and even cause them to die from starvation if they are not provided with caves, a stress free environment and supreme water quality. As your octopus becomes more secure and relaxed in the aquarium, its appetite will grow. Feeding it 2-4 times a day is suitable. As your octopus begins to connect your with feeding time it will also become less scared of you. When your octopus starts to eat more, it will consequently produce more waste products. Monitor the water quality carefully and increase the water changes if necessary. Changing 25 percent of the water every day or every second day should keep the levels of soluble waste down. If you have filters, protein skimmers and other similar equipments in the aquarium you should clean them frequently. Vigilantly monitoring the water chemistry and acting immediately to prevent poor water quality is imperative. The temperature and oxygen levels must also be kept stable. The oxygenation and circulation should be vigorous – inadequate oxygen levels can kill the octopus. The temperature should always stay close to 25°C, which means that you might have to use a heater during colder parts of the year and a chiller during the summer. This will naturally depend on the climate in you area of the world, and more specifically on the temperature in the room in which you are keeping the aquarium. The octopus is renowned for being an intelligent and curious species, and boredom can be just as harmful as too much stress. When your octopus has grown accustomed to its new home you can start giving it things to investigate. This can be practically anything, as long as it has no sharp edges or could harm the octopus in any other way. It should naturally also be toxic free, just like anything that you would put in a normal aquarium. If you want to add plastic pipes or plastic toys for the octopus to examine, the items should ideally be marine safe. The octopus is equipped with superb senses, including very strong eyes. It also likes to touch things and has an acute sense of smell. It has still been impossible to determine whether the octopus can hear and it is believed to be more or less deaf. More research is needed before we can know for sure. It has a well developed nervous system that is located in its eight arms. The brain is circle shaped and surrounds the stomach. Another interesting fact about the octopus is that is has no less than tree hearts to provide all the long arms with enough blood. The blood is not red, but blue. Many octopus species can change their appearance – body shape, colouration and texture – very rapidly. If you frighten you octopus, it can fill the aquarium with ink to hide itself from you.